Personality and Society — such are, indeed, the two polarities of the actual experience of human beings ever since we can trace the historical development of man. The two terms are the concrete manifestations, at the psychological level of modern man, of the two still more general concepts of "individual" and "collective." In every human experience these two factors are present with varying relative strengths. That this is so should never be forgotten. No man acts and feels solely as an individualized personality, or solely as a social being. It is never a question of "either-or" but of "more-or-less." It is a matter of point of view. In a somewhat similar manner we may speak of our Sun as a "Sun" or as a "star." It is a "sun" if considered as the center of an individualized and separate cosmic organism (a solar system); but it is a "Star" if considered as a participant in the collective being of the Galaxy. In the first case, he is alone on his throne; in the second case, he is constantly related to his fellow-stars within the boundaries of the "greater whole," the Galaxy. Man experiences the Sun as light-giver — as a "sun" — during daytime. At night, modern man realizes that this giver of light, this All-Father, is but one "Star" in the companionship of the Galaxy. Overcome by light and heat, we worship the "sun" in devotion; in the silence and peace of the night we commune with the brotherhood of "stars." It is the same reality always, but we change our angle of approach to it — and the one reality divides into two phases of experience, and again into many more phases. The limit to the divisibility of our experience is only our ability to remain integrated as a person under this process of differentiation — our ability to remain sane; which is, to give an integral meaning to our experience as a social personality. The dualism of personality and society becomes in another and more strictly psychological sense that of "conscious ego" and "Collective Unconscious." The realm of individualized consciousness is the realm of day-time, the realm of "Sun." The realm of the Collective Unconscious is the night-realm, the realm of "stars." An understanding of these two realms is necessary in order to see how the waxing and waning of the two cyclic forces operate in a psychological manner. To say simply that the Day-force begins to wane after the summer solstice does not give an accurate psychological picture of what happens within the human person. It is not only that the Day-force becomes less strong. More accurately still, the waning of the Day-force means that what was a positive, active force is becoming more and more withdrawn from the field of objectivity. It becomes increasingly subjective and introverted; also more transcendent. It operates from the point of view of unconscious motives, rather than from that of conscious ones. From such a point of vantage man can see consciousness constantly interpenetrating unconsciousness, rationality rhythmically playing with irrationality — and not be disturbed, or frantically striving to be what he is not. Human experience is forever the outcome of this interplay of consciousness and unconsciousness, of individual and collective. 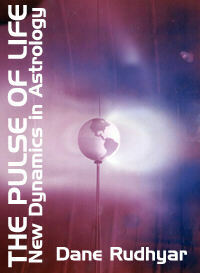 Cyclic life pulsates through every human action, feeling or thought. Reality has a rhythmic heart. The systole and diastole of that heart create these beats of becoming which are birth and death, winter and summer, increase of light and crescendos of darkness. Gloriously, the dance of experience moves on in the hallways of nature's cycle. The Sage looks on, yet every phase of the dance pulsates through his awareness. He is spectator, yet he is partner to all protagonists in the universal dance; every lover knows him as beloved and his mind experiences the throb of every human heart. His vision encompasses all birthing and dying. Upon all things born of the pulsing and the dancing of cyclic Life, he bestows Meaning. And in that bestowal of Meaning, Man, total and free, creates reality.